Today is a quick post showing my recent goodies from Eyeko aswell as my NOTD. I'm hoping to do more of these as they are so quick and simple to do and I always love seeing nail colours. I just LOVE the packaging! So querky and different and fun! When I saw Vintage I loved it, I don't have anything like this in my nail polish collection so this was new and exciting for me! I used 2 coats as normal but sadly on one of my nails the colour looked a little washy and to be honest and could've done with a 3rd coat. Overall the colour pay off is lovely, the brush and bottle are different from anything I have tried in the past and I like it. I was lucky enough as an Eyeko Ambassador to recieve a free Fat Balm of your choice when I made a purchase, so I picked Toffee and LOVE it! The balms are LE, but I'm not sure till when but if you like the look of them then I would pick up one or two or all six of them. The colour is perfect for the cheeks and lips. The smell is better than expected, I really thought the smell was going to be too much or over powering seeings it is Toffee. However you just get a nice hint of the scent just right. Just don't eat it! Slicks of juicy colour, infused with light reflecting particles, moisturising Jojoba oil and added SPF15 make for fuller, softer, sexier lips. Add a hint of colour and shine as you protect and hydrate your kisser! Dab on to cheeks to for a touch of blush. Mineral oil and lanolin FREE! Lastly is one of their NEW! London Lips in Soho. For making my first order as an Eyeko Ambassador I recieved my Ambassador pack which contained a free product... London Lips Soho. I must be honest and say this is a colour which I would normally shy away from. However after being sent this I have a few ideas to jazz up some old lip colours with this shade. 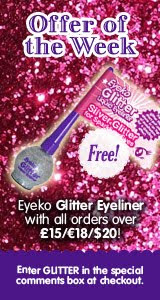 Eyeko has a special offer of the week every week funnily enough ha ha! So this weeks special offer is with every £15 purchase you recieve a free Liquid Glitter eyeliner when you enter GLITTER in the special comments box. I own exactly the same products amongst other products by Eyeko. The 'Vintage' polish is one of my absolute faves! And the fat balm looks really yummy!I think I might buy it soon! i've been wanting to try Eyeko products for the longest but i've never gotten around to it lol.